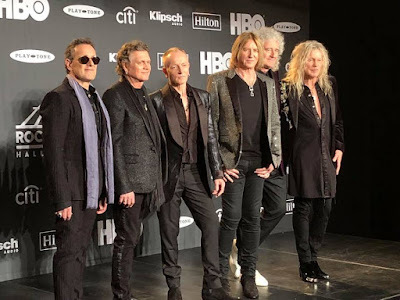 Def Leppard were inducted into the 2019 Rock And Roll Hall of Fame during a March 29 ceremony at the Barclays Center in New York, and video from the event is streaming online. The band also has the rare distincton of earning two diamond-selling albums (1983’s “Pyromania” and 1987’s “Hysteria”) for US sales of more than 10 million copies each. "Those songs we've written over the years were always our main priority,” Elliott told the crowd, “and although there seemed to be a looming sense of tragedy around every corner, we just wouldn't let it in. But it's true: it did seem that every time we made some musical headway, life would knock us back down somewhat. 'Pyromania' is a raging success… then Rick has a life-changing accident. He survived it and came out the other side stronger. 'Hysteria' gave us the global success that we'd always craved… and then we lost Steve. “But we survived and came out the other side stronger people. And that's the way it's always played out throughout our career. So let's face facts here: if alcoholism, car crashes and cancer couldn’t kill us, the nineties had no chance." On a night when Def Leppard were inducted int the Rock Hall alongside Stevie Nicks, The Cure, Janet Jackson, Radiohead, Roxy Music and The Zombies, the UK rockers closed out the evening with a performance of the Mott The Hoople classic “All The Young Dudes” – written by David Bowie – during an all-star jam that included May, Ian Hunter, the Zombies’ Colin Blunstone and Rod Argent, Steven Van Zandt and The Bangles’ Susanna Hoffs. Def Leppard will begin their 2019 live schedule at the Sweden Rock Festival on June 6 as part of a summer trek across Europe.